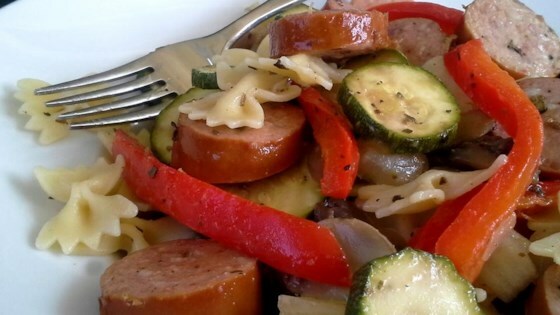 "This is a quick and easy recipe that combines the sweet and smokey flavor of Kielbasa or Polish sausage with fresh sauteed vegetables and a tangy tomato sauce served over bow-tie pasta. My kids love it!" Cook and stir sausage slices in a skillet over medium heat until cooked through, 5 to 10 minutes. Transfer sausage to a plate using a slotted spoon and set aside. Bring a large pot of lightly salted water to a boil. Cook bow-tie pasta at a boil, stirring occasionally, until cooked through yet firm to the bite, about 12 minutes; drain. Heat oil in the same skillet used for sausage over medium heat; cook and stir onion, zucchini, mushrooms, red bell pepper, and garlic in the hot oil until tender, about 10 minutes. Add cooked sausage, diced tomatoes, tomato sauce, tomato paste, basil, oregano, salt, and black pepper to vegetable mixture; cook until sauce and sausage are heated through, 5 to 10 minutes. Stir pasta into sauce and mix well; top with Parmesan cheese. See how to make chicken with vegetables in a creamy cheese sauce. Delicious - no need to make any changes. Only gave it a three because the sausage added some flavor. Otherwise very boring and bland!! Would not make again. I made this to the T according to the recipe. My family loved it! will definitely make again!